I have been concentrating on the DIY's and where to put my regular decor in the new house, I did not do much decorating for fall. Mostly just the outside as you saw in my last post. 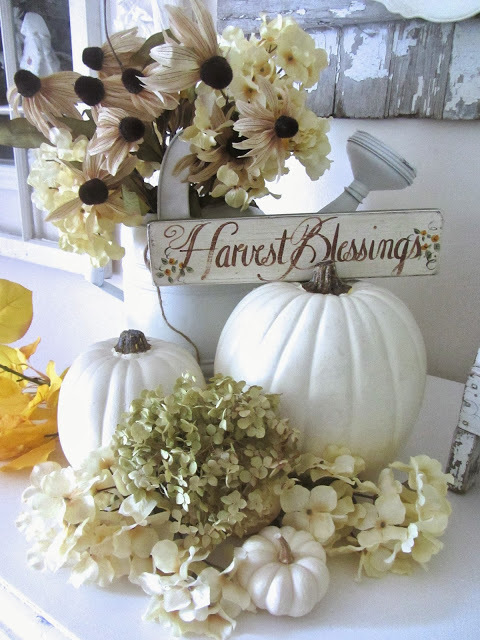 I thought I share a few decor pics from my past fall decor. 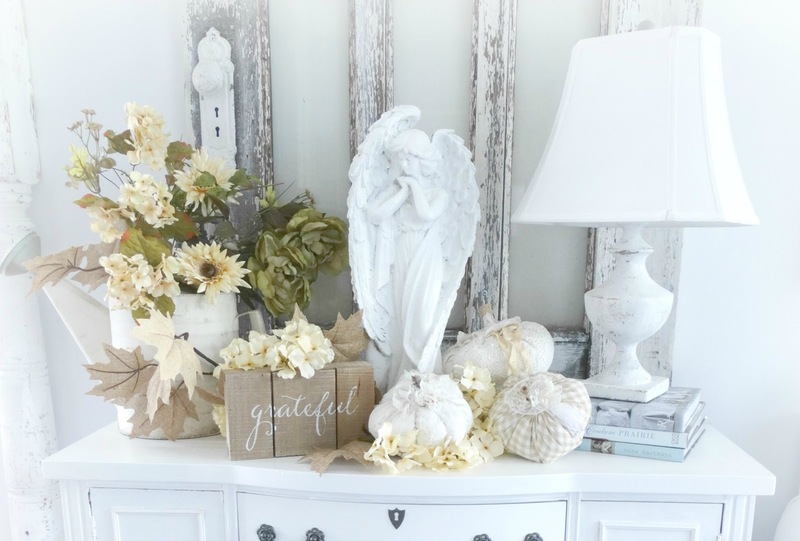 My favorite decor has always been neutral and peaceful. Enjoy these few pics from my past fall decor. 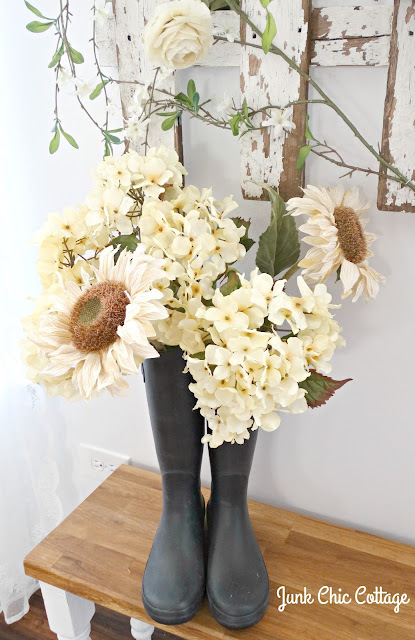 Hoping to get all the DIY's done in this new home so I can show you the rooms before the holidays hit! I just have had so much family stuff on the weekends that things are slow to get done. My handyman is back to long days at work during the week. This just leaves the weekends for us to get things done. I have these sweet garden boots with fall flowers on my porch at the new house this year. Cooper last year loved the sun streaming in the windows. Oh how he loved to bask in the sunshine for long naps. I miss sweet Cooper but now Peggy is filling that void in our hearts. Rest in peace sweet Coop. Miss you buddy. 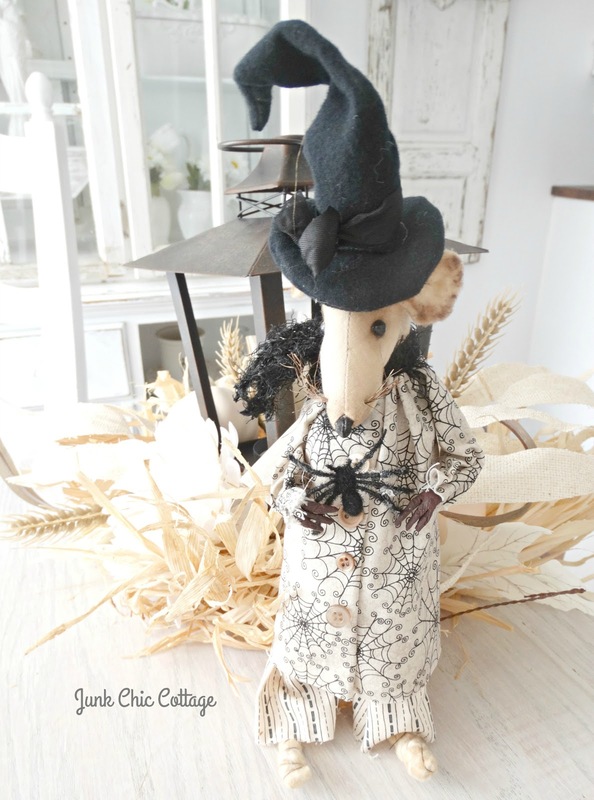 I love seeing the cute little witch mouse that Judy from Gold Country Cottage sent me. Wishing you all a great new week ahead. 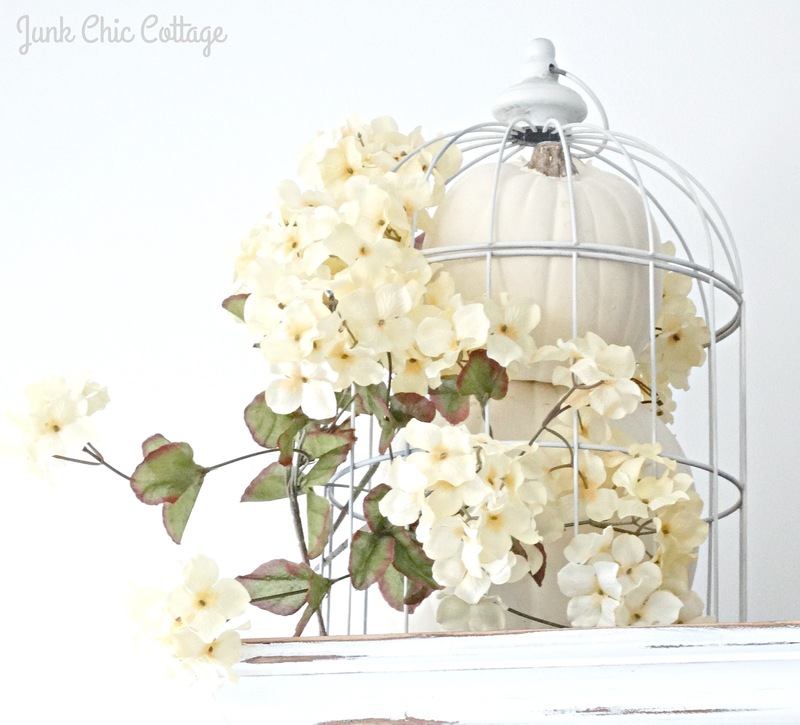 Hope you enjoyed going down memory lane with me on some of my past fall decor. Fall has finally arrived here in Illinois. I did enjoy your walk down memory lane, Kris. You & Terry have such a knack for making a house a home. Have a great week. Pretty! I am just like you. Too busy getting settled to do fall décor yet. Trying to get things done on just the weekends is so hard (and often frustrating)! I know you'll get it done. Love seeing your decor from former years. It is soothing! Sweet Cooper. He just looks so at peace...you all gave him that. (Hugs) Hope you'll share some in progress stuff...sneak peeks. ;) Fall has found us as well - delicious temperatures in the 70's with crisp nights. What a relief! I love our summers but I'm sick of them by September. Enjoy your Fall days too! I never tire of looking at your classic decor pics, Kris...or your sweet Cooper. He was such a good boy...Happy Fall! 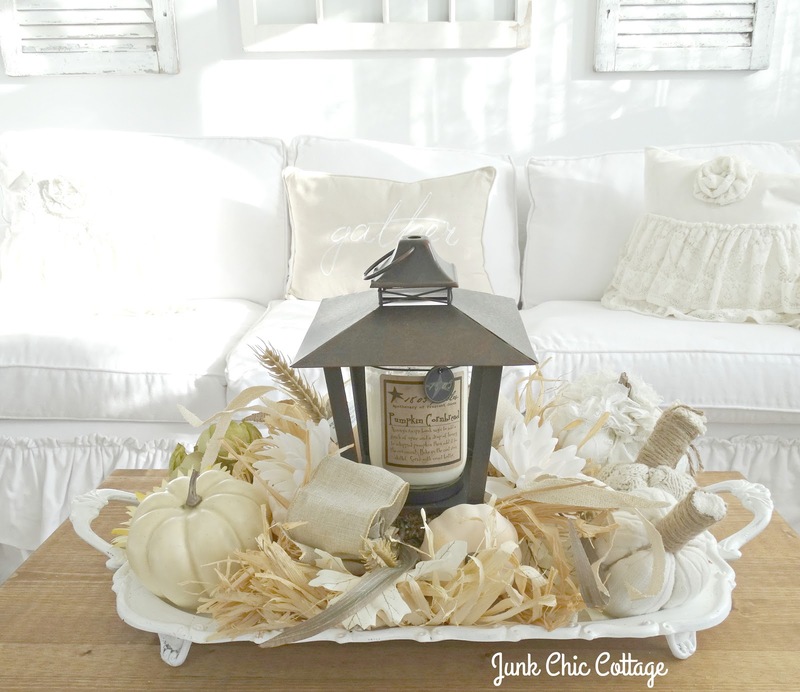 Kris, in your pic of the white tray, lantern and fall decor on the coffee table, I want to ask if this tray was once silver? If so, did you spray paint it white? If so, however does that work? I have an old silver tray that I would love to try this on. As always, I love your taste in decor! I did paint the silver tray with white spray paint made for metal. It came out nice. Pretty easy to do. 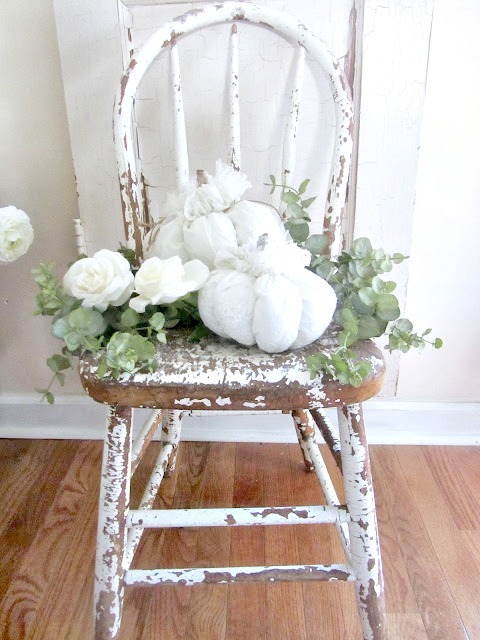 I think white pumpkins might possibly be one of the cutest things on earth! 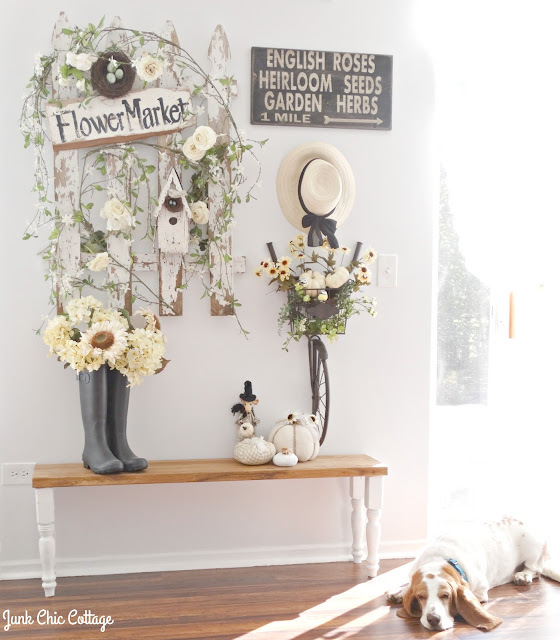 I love your fall decor, and that photo of sweet Cooper makes me smile. So happy you adopted sweet little Peggy! YOu make the most amazing vignettes Kris! No matter the season, everything always look enchanting! 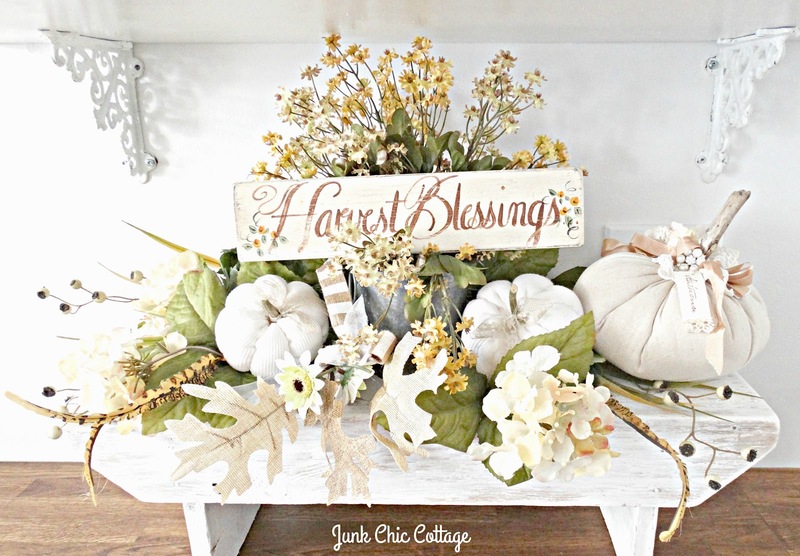 All I can say is that all of your Fall decor is so beautiful and so charming. Looks like Miss Peggy is enjoying her new home and the wonderful people who love her. 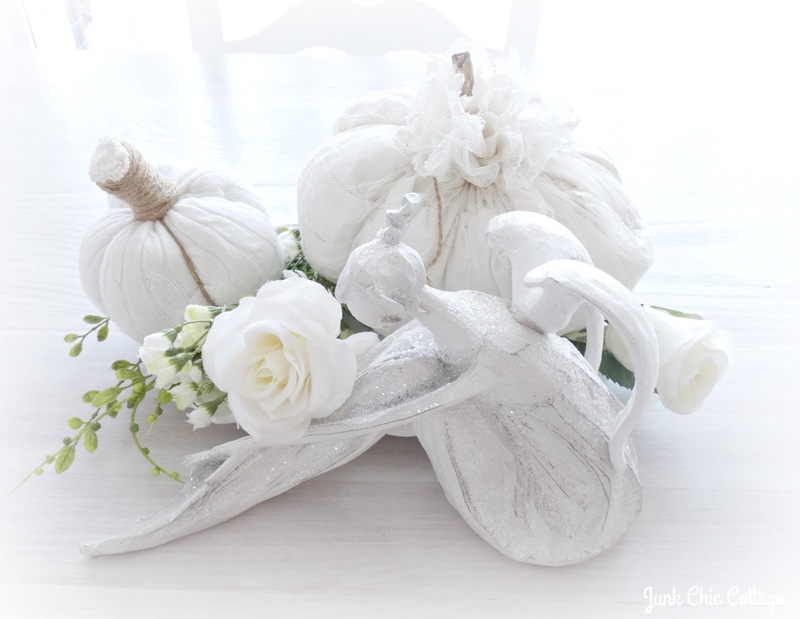 Beautiful.. love those cute white pumpkins..
Everything is perfect. You will get everything in order soon. I really like this home. How is Miss Peggy doing? Bet she loves her forever home. You said that Fall has finally come to Chicago, well summer is back in SO CA, temps reaching over 100 plus. Guess I will be in door all day today. R.I.P Coop. You were much loved! So pretty, Kris! You always put things together so perfectly! Hello dearest Kris! Like me, you're enjoying the photos from past autumns. I have had NO TIME this year to even take many current fall photos. The trees are bare now thanks to the winds from yesterday and we're getting more today. My home looks good but do ya think I even have time to photograph? NOT! Either way, your eye for beauty shines. HAPPY AUTUMN! I'm in love with that sweet little chippy chair. 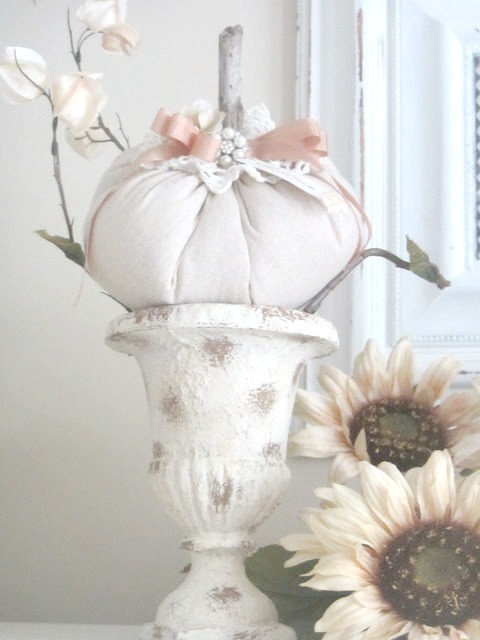 You can even make pumpkins look romantic!!! No matter the season, everything always look enchanting! I just love how you decorate. It is all so lovely. You have a touch! I enjoyed seeing Cooper in the sunshine. Such a gentle hand and magical touch you have to create the most blissful home! I am going to work on decorating our home today-I have been such a slacker! Always a treat to visit your cottage, Kris. It's tough when you only have weekends to work on stuff! Trust me, I know! I have a list a mile long on my kitchen counter of things I need to accomplish when I get some 'spare' time....as if there is much of that in my life! Beautiful photos and decor Kris!! 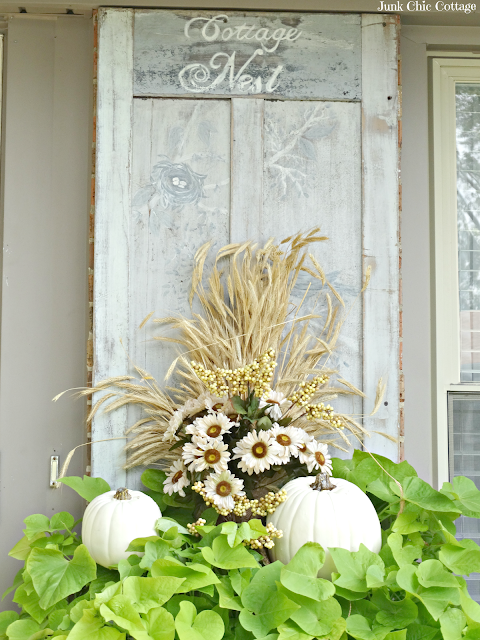 I love the neutral fall too, but this year I snuck in a little aqua and orange here and there. lol. I LOVE your carved lady!! I have never seen anything like her. So pretty!! Kris, no one does neutral like you! Even though I am a color gal I love your style! Kris I enjoyed your Fall décor from over the years. 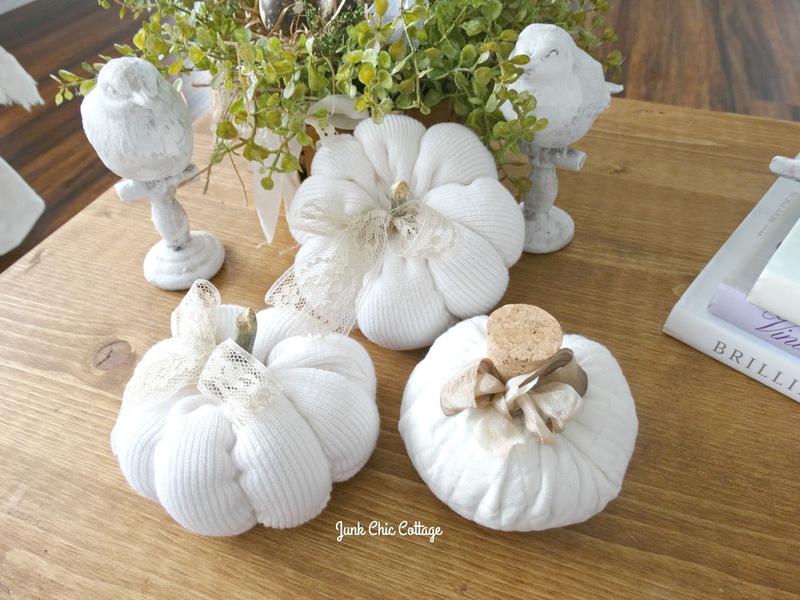 I love your white pumpkins! I love all your cute, white pumpkins. It's a great look at all your past decor.